Whether you enjoy drinking your favorite wine at night or you simply want to collect wines, you need to make sure you’re keeping your bottles at the right temperature. 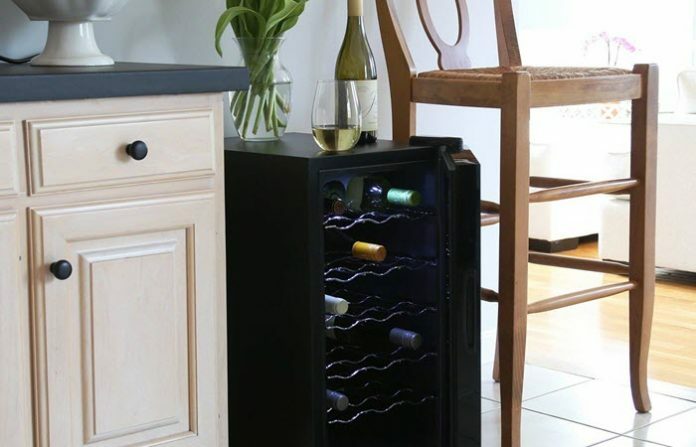 This is one good reason to look into the best wine coolers for home use. Ivation 18 Bottle Thermoelectric Red And White Wine Cooler has a really sleek design. It features a soft interior lighting and an exterior digital display that comes with touch controls. Inside, you’ll find 5 slide-out shelves made of metal. One of the things that made this wine cooler the best for home use is its digital display. With it, you can customize the temperature inside based on what you need and what your wines require. It carries a 10 to 18 degrees Celsius temp which is just right. With polyurethane heavy foam insulation, it can maintain the right humidity. It keeps the cork from drying out and makes sure that its inside remains free from odor. Additionally, it’s designed to block out UV rays and sunlight which are factors that can break down your wines. The only thing you might not like about the cooler is that it has a single-zone chiller. It basically means that you won’t be able to keep both your white and red wines at the same time. 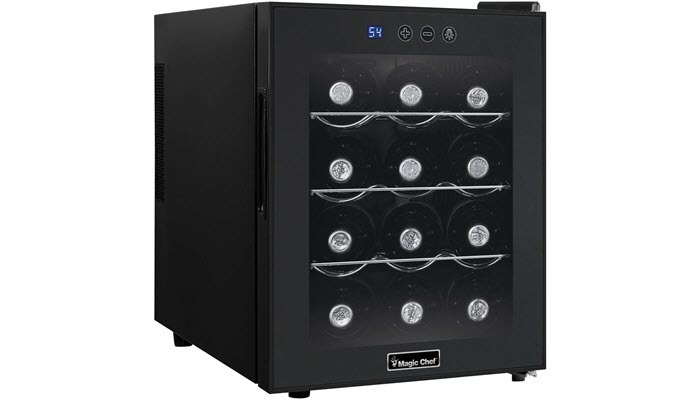 Magic Chef MCWC12B Black 12-Bottle Single-Zone Wine Cooler, on the other hand, has a compact design. You can easily set it up on your countertop to hold about 12 bottles of your favorite wine. 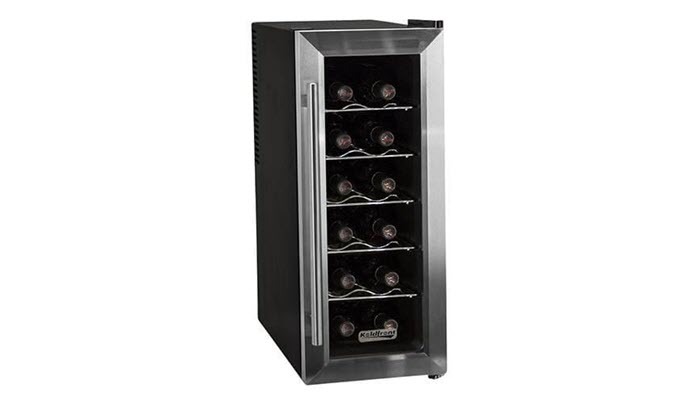 The wine cooler features 3 beveled metal racks that hold the bottles while they are placed horizontally inside. If you need to keep tall or opened bottles upright, you can take out those racks. As for temperatures, this one has a temperature range of about 66 to 54 degrees Fahrenheit. That means that it can work well with all types of red wine as well as a few white wines. Just like the first product, however, it can chill only one kind of wine at a time. The wine cooler isn’t noisy which is great when you’re keeping it at home. It doesn’t use a lot of electricity as well. 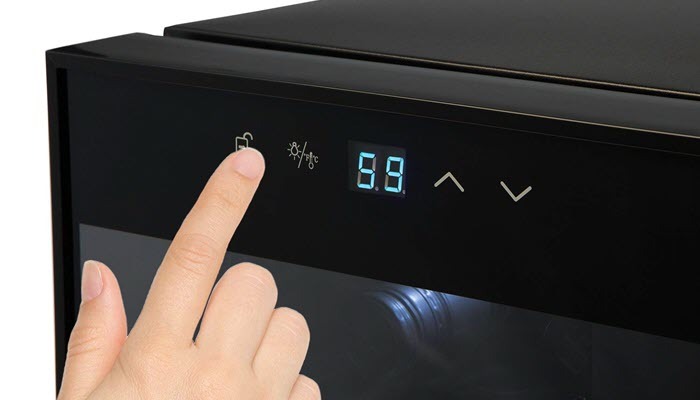 This is because the appliance has an energy-efficient thermoelectric cooling system. 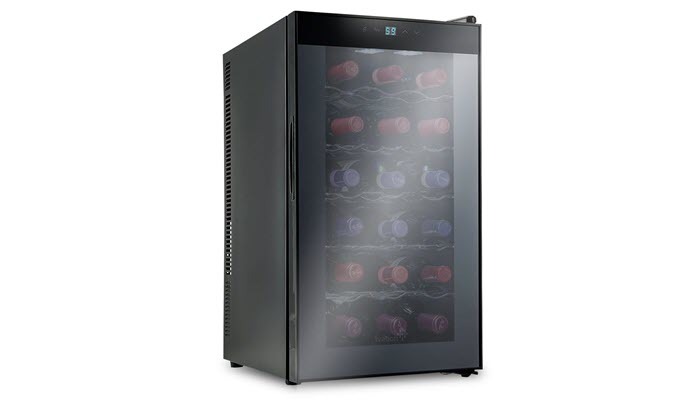 EdgeStar TWR325ESS 32 Bottle Dual Zone Wine Cooler has tinted double-paneled glass doors to make sure that your favorite bottles of wine don’t get exposed to sunlight. And to further ensure that your bottles remain at optimal temperatures, it comes with a digital touch temperature display which you can use to adjust the temperature within the cooler. The wine cooler is great for freestanding application. This means that it’s the best choice if you like moving things around at home. 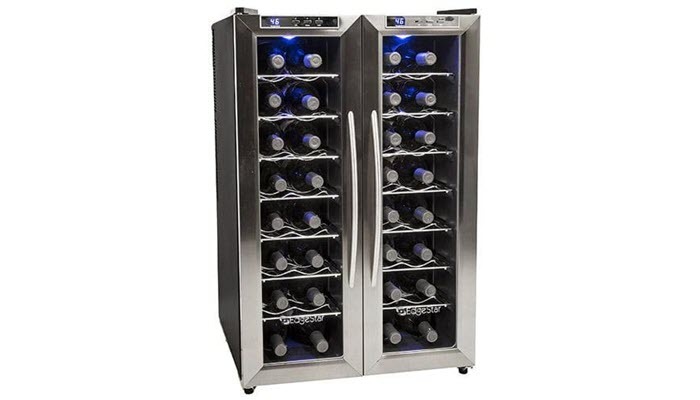 However, if you like a wine cooler for built in use, this may not be the right fit for you. Koldfront TWR121SS 12 Bottle Stainless Steel Slim-Fit Freestanding Thermoelectric Wine Cooler may be the most affordable cooler on this list but it doesn’t fall short when it comes to performance. In fact, with a temperature range of 52 to 64°F, it’s as good as the other ones in keeping wines at the right temperature. This cooler is best for people who have a limited space at home. It has a slim-fit design which means that it leaves a small footprint on your room. It can accommodate standard sized 750ml bottles. For larger ones, you’ll need to take out the scalloped chrome racking to fit them. Wine coolers come in a variety of sizes and they are often determined by their bottle capacity. The more bottles a cooler can hold, the larger it will be and the more space it’ll take in your kitchen. 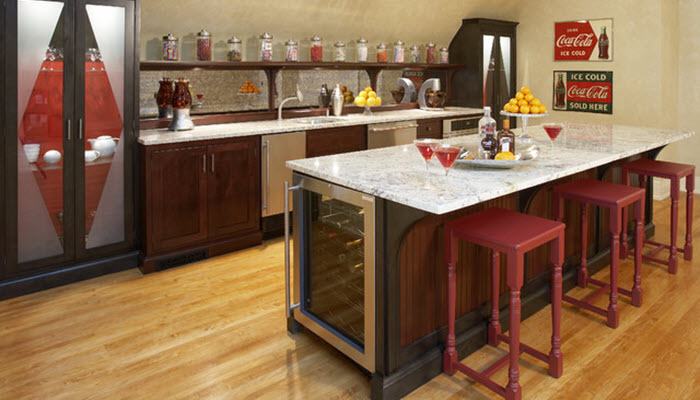 If you’re just building your kitchen or you’re remodeling it, you can get a built-in wine cooler for a seamless look. However, if the layout of your cabinet doesn’t offer enough space for a built-in cooler, your next best option is to look for freestanding models. If you’ll be placing your cooler in your kitchen and you want it to blend well with the rest of the interior, you can choose furniture-style models. Most of them are encased in finished wood for a less conspicuous appearance. Ideally, most wines should be stored in a cooler that can keep them at around 45 to 55 degrees Fahrenheit. For some experts, you don’t really need to keep white and red wine at different temperatures. They, however, require different serving temperatures. White wine is best served chilled while red wine needs to be a little bit warmer. This is where it’s practical to invest in a cooler with dual-temperature zones. Just like the rest of your appliances, wine coolers also come with a variety of features. This includes alarms, LED lighting, safety sensors, and digital temperature displays. Some models use a different kind of material for their racks. 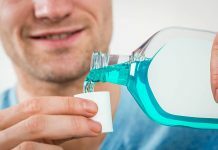 In choosing which extra features to go for, keep in mind to pick only what you think is necessary. All those extra features can increase the price of the coolers. In our search for the best wine coolers for home use, we found Ivation 18 Bottle Thermoelectric Red And White Wine Cooler at the top of our list. This cooler has the most important features in storing wines at home. It has a digital display and touch controls which make it easy to use and adjust. It also has a good insulation to prevent too much humidity from ruining your bottles of wine.